Serve this simple-to-assemble tangy pork ribs on a bed of leavy greens, or enjoy it as a complete Western meal with soft creamy mashed potato and lightly salted blanched mixed vegetables. You may prepare the marinating the night before, for even greater flavour to be yielded… When ready, simply roast it in oven and you will be able to get this served in a flash. Whet your appetite with the zesty and mild saltiness of hoisin sauce flavours in the ribs even in the busy weeknights! 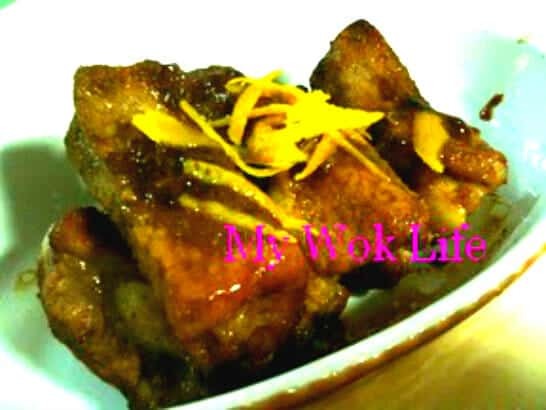 1) Season pork ribs with hoisin sauce and fresh orange juice. Make sure each rib is well coated with the condiments. Marinate ribs in refrigerator for at least 3 hours. It’s best if could marinate overnight long. 2) Preheat oven to 200°C for 15 minutes. Remove marinated pork ribs from refrigerator. Add in orange essence and sprinkle potato starch on the ribs. Mix well. 3) Now, line one sheet of aluminum foil on the baking tray, and transfer pork ribs onto the tray. Do not transfer or dispose the marinating sauce. Keep the sauce for later. 4) Place the ribs on baking tray on second rack and bake for 20 minutes, or until ribs are golden browned. Then, turn the ribs over and bake for another 2 – 3 minutes. 5) Add and dissolve honey in the marinating sauce you have kept earlier on. Now, brush the honeyed marinating sauce on both sides of each rib, and then drizzle the remaining sauce onto all the ribs un the baking tray. Continue to bake for 2 – 3 minutes. By now, all ribs should turn juicy tangy brown. Arrange ribs on a nice serving dish. Garnish and serve immediately. Serving of 1 rib in my recipe counts about 180kcal. Tips: Ribs can be cooked and served in a rack instead of separate cuts, as your wish. * If desired, choose to roast the ribs directly on skillet instead of baking method. * Addition of orange essence is to enhance the tangy flavour to it’s maximum. However, it’s optional if you prefer milder tanginess. Hi Steph, thanks for following my blog.. Please cook this and do let me know the outcome. 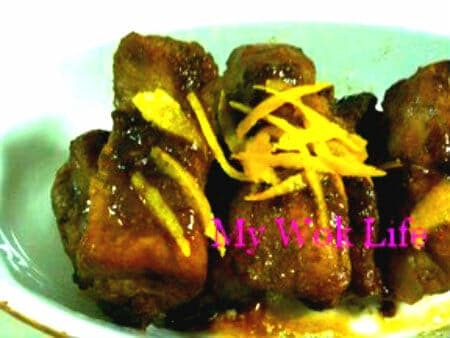 This Roasted Fragrant Orange Pork Ribs is one of the most amazing dishes I have ever taste. What I really love about this dish was the Scent of it. It really smells so good. your recipe sounds great and enticing…. Will definitely try it out. Thanks. But a word of wisdom, your pictures aren’t really attractive. Doesn’t pull the eyes in. Probably with the colour saturation. Consider to invest in a better camera ok? Hi, thanks for visiting my blog..